A next-generation NASA relay satellite was launched into orbit Wednesday (Jan. 30) on a mission to upgrade a vital communications network linking the space agency to its spacecraft orbiting the Earth. The U.S. space agency's first launch of 2013, the new Tracking and Data Relay Satellite K (TDRS-K for short) soared spaceward atop a United Launch Alliance Atlas 5 rocket from Cape Canaveral Air Force Station in Florida at 8:48 p.m. EST (0148 Jan. 31 GMT). "We have a customer that's quite thrilled right now to have a healthy satellite on orbit," Tim Dunn the TDRS-K flight director said in a NASA TV interview after the launch. The TDRS-K satellite is bound for an orbit 22,300 miles (35,888 kilometers) above Earth, where it will join a constellation of five other satellites currently in orbit to help NASA and other space agencies stay in touch with orbiting spacecraft. NASA's TDRS-K communications satellite launches on the night of Jan. 30, 2013 in this screenshot from NASA TV. The TDRS-K satellite is expected to spend at least 15 years, but agency officials expect that the satellite will exceed its projected life-expectancy. Many of the network's satellites have outlived their expected mission lifetimes, said Jeffrey Gramling, NASA's TDRS project manager. But that does not mean that TDRS-K is unnecessary. One of the satellites currently in active service is slated be retired in the next few months, and other satellites in the aging network are getting older, said Badri Younes, a scientist in NASA's Space Communications and Navigation office. The satellite launched today was the first of three new satellites expected to enter service between now and 2015 that should further bolster the network. The TDRS-K mission costs between $350 million and $400 million, not including the price of its rocket. The TDRS-K satellite is 26 feet long (8 meters) and weighs about 7,615 pounds (3,454 kilograms). 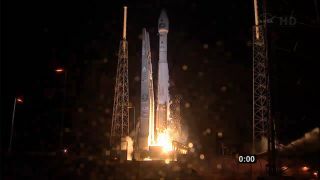 It was expected to separate from its Atlas 5 rocket one hour and 46 minutes after liftoff, with a Centaur upper stage rocket engine slated to carry it the rest of the way to its geosynchronous orbit. The satellite is expected to deploy its solar arrays and giant antennas about 11 days after launch, according to a mission description. NASA's TDRS satellite network is part of the larger "Space Network" used keep space agencies on the ground in constant communication with orbiting spacecraft. The International Space Station sends all of its data and messages through the network using the TDRS satellites. The rocket that sent TDRS-K into orbit even uses the space network to beam down data, Vernon Thorp, a program manager with NASA said. TDRS-K is now entering into a three month period of testing and calibrations, but once those tests are complete the NASA research team will decide if the satellite is ready for service.